Adapted from Spanish calderetas, or stews, this incredible Filipino specialty varies by provinces but is best known as a goat dish. Kalderetang Kambing is a tomato sauce based goat meat stew. 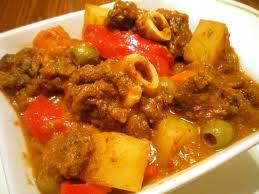 The adult goat meat, Chevon, is commonly used for this dish. The meat is sautéed with garlic, onions, and tomatoes then stewed until it becomes tender. Season goat meat with salt and pepper and marinate in vinegar with 1 tablespoon of crushed garlic for a couple of hours. Brown marinated goat meat in a large pot or Dutch oven in oil heated over medium high heat. Reduce heat to low-medium and cover the meat first with chopped onions, then diced tomatoes and garlic. Do not stir! Cover and let cook until the onions have dissolved and meat is tender (check after about an hour). Add potatoes and carrots, season with additional salt and pepper to taste. Continue stewing until vegetables are tender. Add grated cheese, olives and bell pepper then stir well. Heat through until cheese melts into the sauce. Remove from heat and serve with steamed rice. Organic brown Basmati Rice is particularly good.